For a long time “The aftermath of World War 2” is going through my mind. I especially think of the emotional effect is had on the different generations of Jewish family’s, also because of being third generation myself. In spite of the fact that I can’t acknowledge my Judaism, ’cause my mom is a catholic, I can say that it made me into the person I am right now. It is a subject that is very important for me to think about. 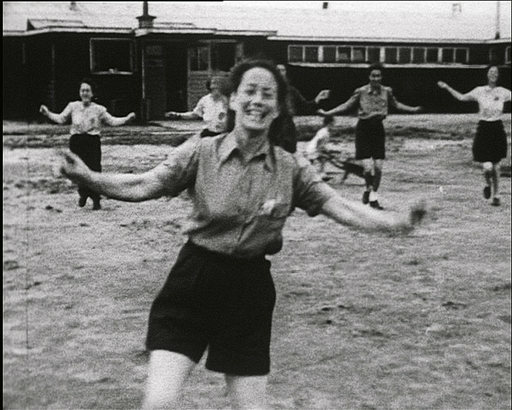 The work of Harun Farocki, about the Dutch concentration camp Westerbork, gave me the inspiration to deepen my thoughts en emotions about this much-discussed subject. After doing some research on the work “Respite”, I found a YouTube film where Farocki explains how he is interested by traumatized generations. He’s not only talking about World War 2 victims, but he is talking about traumatization in general. Maybe we can see this interest as a starting point of his work. Another thing he talks about, which I think is very interesting, is this philosophy where they say that you have to experience the trauma again by smelling, feeling or hearing it, only after which you’ll be able to erase it. This is really something I want to explore for myself too. He is also talking about Alain Resnais, who was one of the founders of the Nouvelle Vague. This was a movement of young movie directors who tried to analyze Hollywood Cinema as critical as possible, and in doing so make a very radical change in cinema. Farocki tells about being inspired by this movement and especially by this kind of analysis of film. In “Respite” you can really see that this intrigues him. After seeing the work of Farocki I wondered what his intentions where. Did he mean to put the genocide out of his context, the downright association that everybody has: death. If yes, is that even possible? Can one see the Holocaust out of its context by only looking at photo footage? There was another thing that really caught my attention, the used photo material in the film, made by Rudolf Breslauer. These photo’s where not photo’s of stolen jewellery which was property of the Jewish inmates or remains of cut off hair, but they where photo’s of people who were laughing and doing there usual daily routines. Showing the humanity of it. The humanity that was still there, under the most horrible “scenery”. This point got me into thinking. And to put this point to my own situation; How is it possible that a damage of this kind, does not take the humanity away. And is that even true? Once my dad told me about a moment out of his youth. It was about a conversation with his father, my granddad. After a talk about future plans and dreams, my granddad told my dad that he had no personality. The most painful thing you can imagine a father telling you. After he told me about this comment, I burst out into tears. The man was so harmed by the things he had been through. that he lost his ability to give love. Love, the thing humanity is based on. After I stopped crying I came to the realization that not only my dad suffered from his traumatized father, but I did as well. It became clear to me that this pain was passed on from generation to generation A pain that exists out of so many layers and is therefore extremely difficult to solve. A pain that I carry with me because my father raised me up with it. Sometimes I’m scared of the thought that it will never end because of the fear to solve it, and that I will pass it true to my children or other loved once. Although I do think that it will become less, and time will solve a lot. But it will take a lot of time. In the end I can ask myself, if I once more relate my situation to the work of Farocki, is it true that people laugh their fears and sadness away. Cause I see that in my father as well, is that why our communication is only possible by laughing about everything, and talking about nothing?